More of "the great ones" pass away. Attention tax professionals! Michael Gray will give a two-day LIVE seminar on January 9 and 10. Attention employees with stock options! Michael Gray will give a LIVE lunchtime seminar on January 16. Attention employees with stock options! Michael Gray will give a LIVE telephone seminar on January 17. Final regulations for 3.8% net investment income surtax. Payment of compensation to IRA owner by corporation owned by the IRA was a prohibited transaction. Sign up for health insurance by December 23, 2013. Corporate estimated tax payment due. Non-corporate estimated tax payment due. Remember de minimus election requirement applies January 1. Visit our new article: No BS Time Management. 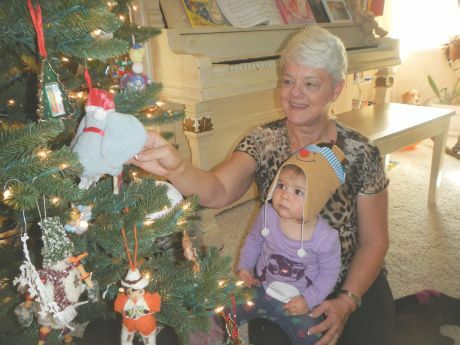 Minerva Siemer checks out the Christmas Tree with Grandma Janet. Michael Gray will have very limited availability for the rest of 2013, so make your year-end planning appointment now. Call Dawn Siemer Monday, Wednesday or Friday at 408-918-3162. Our client, James Barrese, was featured in an interview in the Business Section of the San Jose Mercury News (page B-6), on Saturday, November 30, 2013. James is the Chief Technology Officer at PayPal. The title of the article is "Wallet's Days Numbered?" You can check it out at the web site www.mercurynews.com. Here is a link to the article. Congratulations, James! I learned from Dan Kennedy that three great business and marketing leaders recently passed away. Michael Vance was the first dean of Disney University and creative thinking teacher to other leaders like Apple Computer co-founder Steve Jobs. Martin Edelsten was the founder of Boardroom Inc., publisher of the Bottom Line series of newsletters and self-help books on health improvement. (Boardroom Publications receives competitive entries of marketing pieces from some of the world's greatest copywriters. It is one of the biggest direct mail marketers in the world.) Jim Straw was one of the trail blazers in direct marketing. He wrote "home-spun" marketing pieces that appealed to regular folks, mostly about business opportunities. These are individuals who made a difference, and touched most of our lives, even if we didn't know it. Michael Gray, CPA will give a two-day live seminar on Thursday and Friday, January 9 and 10, 2014. The seminar is "Secrets of Tax Planning For Employee Stock Options", celebrating an update of the book with the same name. The investment is $2,497 for the first person from a company and $1,247 for additional persons from the same company. The seminar will take place at the Marriott Courtyard hotel in Campbell, California. A copy of the book and lunch for each day will be included. Only nine seats are available. For details and to reserve your place, call Dawn Siemer at 408-918-3162 on Mondays, Wednesdays and Fridays no later than January 3, 2014. IRS issues final regulations for 3.8% net investment income surtax. A 3.8% federal "Medicare" surtax on net investment income for high income (Modified AGI over $250,000 for married persons filing joint returns, $200,000 for singles) taxpayers was enacted as part of Health Care Reform legislation in 2010 and became effective January 1, 2013. Proposed regulations explaining the tax were issued during December 2012 and proposed Form 8814 has been issued by the IRS without instructions. The IRS issued final regulations on November 26, 2013. The regulations aren't effective until January 1, 2014. The details of the tax and the regulations are too complex for me to explain here. You really have to consult with a tax advisor to determine how the rules apply for your situation. A highlight in the IRS's explanation is a "real estate professional" won't automatically qualify net rental income as business income exempt from the tax. The IRS has created a 500-hour safe harbor test to meet the trade or business requirement. See your advisor for details. The IRS removed the rules for sale of an interest in a partnership or S corporation from the final regulations and issued new guidelines in proposed regulations. The new guidelines look to the passive activity rules for classifying gains. More details were added relating to liquidating distributions from partnerships, such as payments to retiring partners. The Tax Court, in a memorandum decision, recently made a ruling that may hurt a lot of people with self-directed IRAs. In this case, an individual made an investment using his IRA in a 98% ownership interest in an LLC doing business as a used car business. The LLC elected to be treated as a regular corporation. The LLC paid a small salary to the IRA owner for his services as general manager of the used car business. The Tax Court ruled that the payment of compensation to the IRA owner was a prohibited transaction. The IRA owner was a fiduciary, ineligible to receive compensation from the IRA. Despite the separate status of the corporation for tax purposes, it was controlled by the IRA and by the owner of the IRA, and so its action of paying compensation was attributed to the IRA. Since these were prohibited transactions, the IRA was treated as distributed at the beginning of the year that compensation was first paid and added to the IRA owner's taxable income. The 10% early distribution penalty and an accuracy-related penalty were also assessed. A taxpayer in a situation like this should consider applying to the Department of Labor for a waiver from the prohibited transaction rules. This ruling may not be the final word for this case. The taxpayer might appeal the ruling. Sign up for health insurance by December 23, 2013 for coverage on January 1, 2014. Although federal penalties won't apply provided you enroll by March 31, 2014, you must enroll by December 23, 2013 to be covered on January 1, 2014. If you change coverage after January 1, 2014, you might have two deductibles for 2014. See your health insurance consultant for details. Fourth-quarter calendar year corporate estimated tax payment is due December 16. The final 2013 estimated tax payment for calendar-year corporations is due December 16, 2013. Not all corporations can base their federal estimated tax payments on the previous year's income tax return. For example, new corporations and corporations that had no tax liability for the previous year must compute their estimated tax using the current year's facts. See your tax advisor for assistance. The first property tax payment for the 2012-2013 fiscal year in Santa Clara County is due December 10. Avoid a late payment penalty - mail your payment early! The increase in the maximum federal income tax rate to 39.6% and the 3.8% tax on net investment income hit estates and trusts especially hard. They apply when the undistributed trust income exceeds $11,950. If possible, the income of the estate or trust should be distributed to beneficiaries before the year-end, since the threshold for these taxes is much higher for individuals. (The income of some trusts is automatically considered distributed. See your tax advisor.) An election is also available to treat distributions made during the first 65 days of the following year (for example, January 31, 2014) as distributed for a taxable year (for example 2013). In order to make contributions for 2013, business retirement plans such as 401(k) plans and profit sharing plans for calendar-year businesses must be in place by December 31. Employee contributions to a 401(k) plan must also be paid by December 31. If yours isn't in place yet, contact your retirement plan advisor immediately. Remember the increased expense election and bonus depreciation are scheduled to expire after December 31, 2013. Congress might extend these incentives, but we don't know if they will. Consider making your business equipment purchases before the end of the year. See your tax advisor for details. Software providers will issue updates including the new payroll tax tables as of January 1, 2013. Be sure you have installed those updates before processing your first payroll for 2013. It's the season for giving. Many of us make extra donations during December to share our bounty with others. Appreciated publicly-traded stock that has been held for more than a year is an ideal asset for a donation. Under the Internal Revenue Code, the long-term capital gain is excluded from taxable income and the charitable contribution deduction is the fair market value of the stock, so there is a double tax benefit. Also, publicly traded stock isn't subject to the appraisal requirements that apply for other property. It's a win-win-win! Remember to get a good acknowledgement letter to document the donation, including a statement that "no goods or services were received in exchange for the donation". Final regulations for repair expenses and capitalization include a new election to currently deduct small expenditures when the taxpayer doesn't have an applicable (audited) financial statement. Items up to $500 may be currently deducted, effective for amounts paid or incurred for tangible property after January 1, 2014, for taxable years beginning on or after January 1, 2014. The election doesn't apply for inventoriable costs. In order to be in position to make the election for 2014, you must have the accounting policy in place by December 31, 2013 and implement that policy in your accounting throughout 2014. December 6, 2013, Greg Carpenter, BTI Group Mergers & Acquisitiions, "Preparing to sell a business"
December 13, 2013, Greg Carpenter, BTI Group Mergers & Acquisitions, "Buying a business"
December 20, 2013, attorney James V. Quillinan, Hopkins & Carley, "Should a family trust be terminated considering recent tax law changes?" December 27, 2013, Peter Moss, Wymac Capital, Inc., "Mortgage market developments"
January 3, 2014, Don Pollard, CLU, Advanced Professionals, "How Health Care Reform is progressing for individuals"